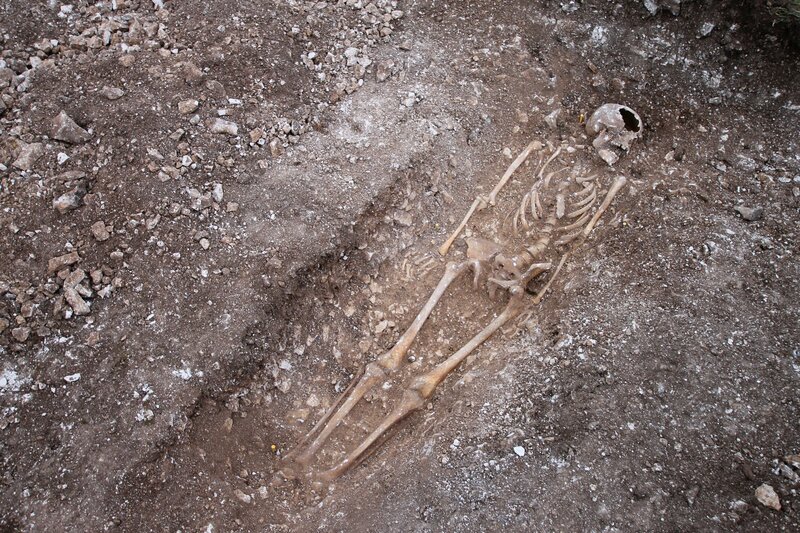 The skeleton of a man from the late Anglo-Saxon period has been discovered during an archaeological survey along the cable route of the Rampion Offshore Wind Farm in the South Downs region off the coast of Sussex. Archaeology South East were contracted by European electric company E.ON to excavate the installation path of the cable that will carry the wind farm’s power and have so far unearthed archaeological material — flint tools, pottery, evidence of cultivation — dating from the late Neolothic to the Bronze Age, Roman era, Middle Ages and the post-medieval period. The complete skeleton interred in a grave hewn from the chalk bedrock South Downs is famed for is the most exceptional of these finds. The skeletal remains of the adult male were found in 2015 on Truleigh Hill near Shoreham, West Sussex. Osteological analysis indicates he was between 25 and 35 years old when he died and likely lived a hard life up until then. There is evidence of a healed fracture on his left arm and repetitive stress on the vertebrae caused by bending or twisting movements. The skeleton was intact, missing only a few small bones from the hands and feet. There is no evidence of a coffin. He was placed in the grave on his back with his arms at his side in the east-west alignment typical of Christian burials. 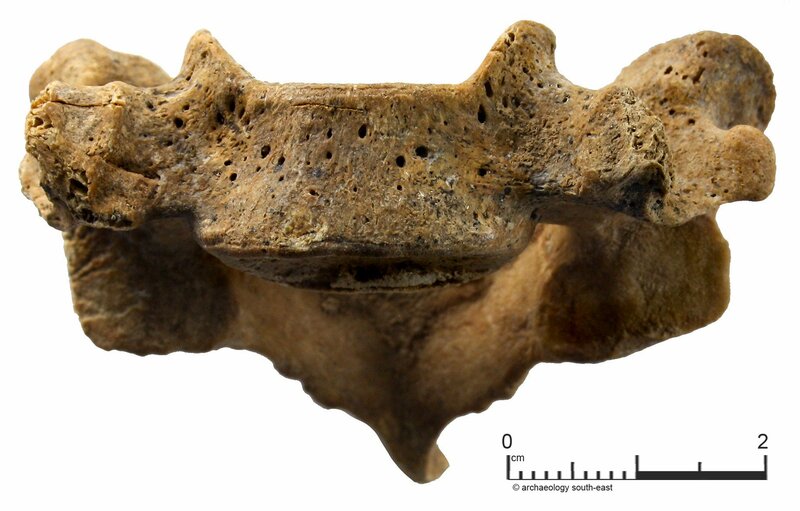 Jim Stevenson, Project Manager for Archaeology South East, said: “Radiocarbon dating has revealed that the skeleton is most likely to be an execution burial of the later Anglo Saxon period. The grave site was located in an area known to have prehistoric graves. Apparently there were once burial mounds visible, but they were excavated flat in the 18th and 19th centuries and the digs were poorly documented so it’s not possible to pinpoint their location today. Isolated burials were sometimes found near the mounds. Perhaps this fellow having been condemned to death was denied access to a Christian cemetery and buried at an ancient holy site instead.